Fleet Feet decided that the company’s longtime logo could no longer keep pace in today’s fast-moving business landscape, so at last week’s franchise conference in Minneapolis, the company’s leadership team unveiled a brand refresh that signals a new leg in the retailer’s journey. “We’re a brand 42 years in the making—or as we like to say, 42 years of a lot of sleepless nights,” Fleet Feet CEO Joey Pointer told SGB. Those many sleepless nights yielded a rebranding campaign that includes a few new features. The most prominent is the addition of a “torch” image placed in between “Fleet” and “Feet” in the company’s logo. “The base of the logo symbolizes the spark of inspiration provided by Fleet Feet to runners, while the top portion represents the flames of commitment fanned by the brand through its staff, gear and programs,” the company said in a press release. Besides, he added, customers rarely used the “Sports” when mentioning the store name and associates rarely used it when answering the phone. “And the city name is important to us since the stores are locally owned and operated,” Pointer added. Though Carrboro, NC-based Fleet Feet debuted the logo—which looks like an “F,” giving it a dual purpose—to stores and vendors last week, the company didn’t unveil the rebranding to the general public until Tuesday. The logo changes, which also feature new fonts and color schemes, better capture the spirit of the 42-year-old retailer, Pointer said. Still, the move wasn’t without risk. 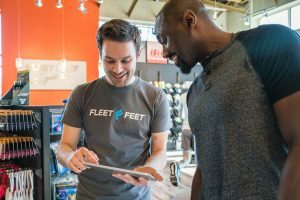 While he wanted to bring an iconic image to Fleet Feet’s logo in the way that Starbucks and Lululemon are easily identified by their siren and stylized A, respectively, he understood that changing a company’s look and feel is laden with pitfalls. The updated logo is being rolled out on fleetfeet.com and the brand’s national social media accounts. Stores will adopt a rolling change starting Tuesday for all digital assets, with printed assets following behind over the next several months. The new logo also will be incorporated in some co-branding efforts, including a shoe with Brooks and an insole with Superfeet, in addition to private label footwear and apparel. Fleet Feet, whose footprint now includes 176 locations in 37 states, continues to honor the company’s storied past while also moving forward. The company last year rebranded its running groups as Fleet Feet Running Clubs as a nod to their former name. And a new collaboration with Brooks will also pay tribute to the house where Fleet Feet was founded in Sacramento, as well as the colors and styles of the 70s.